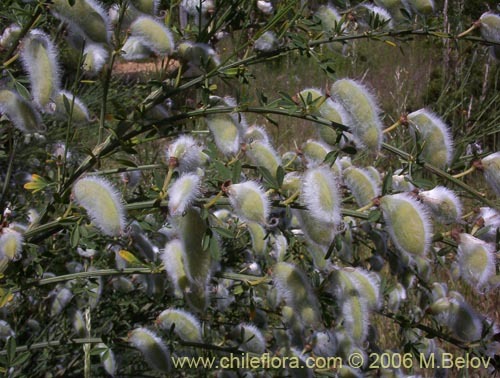 Species: Cytisus striatus (J.Hill) Rothm. 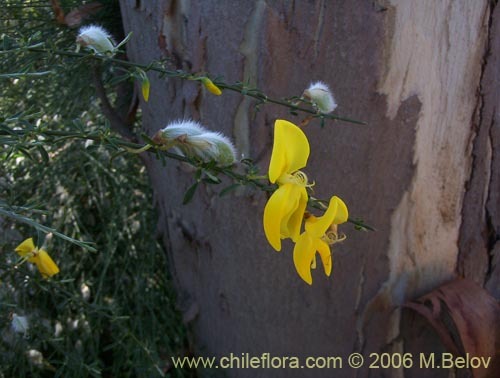 About 2 Cytisus in Chile and 2 in our data base. This plant is not Chilean and was introduced from southern Europe. It managed to adapt itself well to the local conditions, too well one might say, because it is considered in some areas as a great nuisance being a weed difficult to eradicate. Itgrows successfully in central y southern areas of Chile. 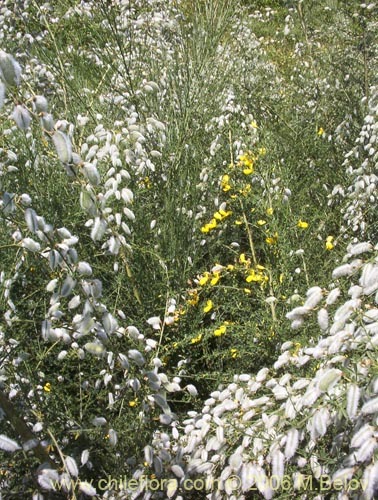 Despite its foreign origin, it seems to integrate well into the local environment, and due to the beauty of its flowers as well as of its fruits, the persistent hairy legumes, can be regardedas an ornamental shrub par excellence, especially considering the fact that it is very easy to propagate and grow. 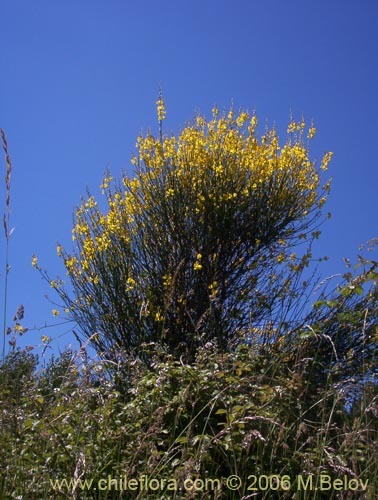 In Chile, there are entire highways where the plant covers the borders, and in spring the yellow flowers which appear in large numberson the long, thin branches which oscillate slowly in wind create a sensation as if one is navigating a tropical river with yellow cascades flowing in from both sides. Later, when the seeds appear in hairy whitish legumes, the tone of the roadsideschanges to more subdued and sober accents, which are nevertheless equally beautiful, because now the plant emanates tranquility and softness of the approaching autumn. 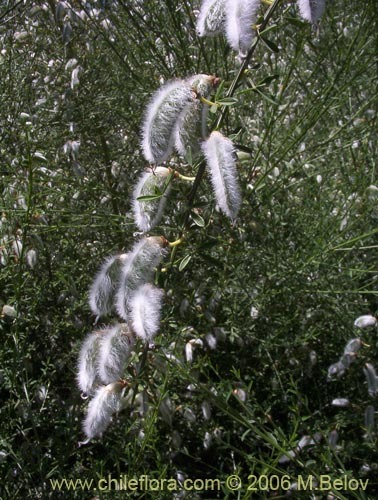 This is a shrub which can grow as tall as 6 meters, but generally is much lower (2 - 3 meters); it has long, thin, grey stalk and branches. The leaves are compound and consist of three leaflets, of about 2 cm. long, lanceolate, entire. The flowersare generally axillary, yellow, of the characteristic shape of the papilonaceae and are 2 - 3 cm. in diameter. The fruit is a legume covered by long, soft, white hairs and has several small brown seeds. The plant flowers in September - December, andthe fruits appear from December through February. This plant grows at lower elevations, it prefers sunny spots with some humidity, and good drainage, but generally is not too picky about the conditions. It tolerates occasional freezing temperatures, but it is not suited for places with snow cover.In Chile it can be found in Central and Southern regions, with maximum concentration in the 7th Region, where it found the right balance between the humidity and temperature. This plant is ideal for gardening due to its flowers and decorative legumes. It germinates very easily, does not require cold stratification (although it can be sawn in the autumn directly), and grows quickly.